New AIO (All-in-One) from Britemax is a high-tech, user-friendly polish formulated with the latest scientifically engineered polymers and waxes and can be used as a one-step cleaner or as a second-step on aged paint that has been pre-cleaned. It can be applied by hand or by a machine application and lightly cleans clear coats, removes irritating swirl marks, light oxidation and leaves a glossy protective finish on the vehicle’s body. I tried it on the totalkitcar BMW X5 workhorse that was badly in need of a clean-up and managed to get a really good easy-on;easy-off finish in ten minutes, between showers and it seems a snip at just £13.95 as it did everything it claimed on the bottle label. 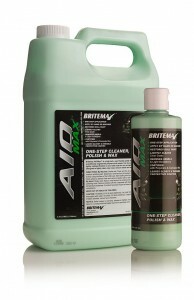 More information from www.britemax.co.uk ENDS. Print article This entry was posted by admin on August 16, 2012 at 2:37 pm, and is filed under News. Follow any responses to this post through RSS 2.0. Both comments and pings are currently closed.